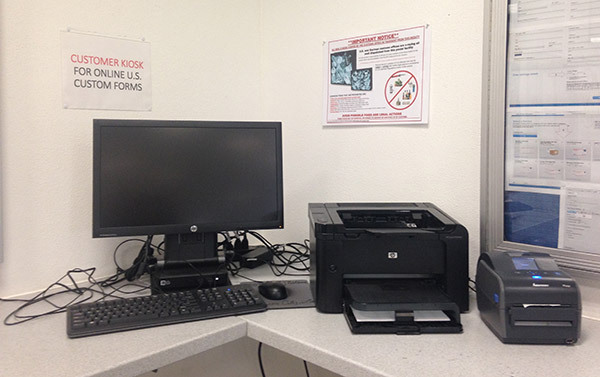 The computer and printer kiosk available to USPS patrons at the Tower Barracks post office. The post offices will accept the hard copy customs form until further notice, but you are encouraged to use the online form. GRAFENWOEHR, Germany — The U.S. Postal Service will soon require patrons to complete customs forms online for all packages. The new procedures — which are expected to go into effect at the beginning of 2016 — are part of customs tracking system known as nesting. Nesting provides the customer point-to-point tracking visibility from origin to final destination. What’s changed and how does this affect me? In the past, USPS patrons filled out customs forms by hand at the post office for all packages. Customs forms are required when shipping packages overseas, both to and from the U.S. and international countries. That remains the same. But now, you must fill out the customs form online, print a minimum of two copies and bring them to the post office with your package. This new procedure also affects customers shipping from the U.S. to international countries. You do not need customs forms for letters or cards. Free computer usage and printing services are available at the USO on Tower Barracks and any U.S. Army Europe library on-post. The USAG Bavaria post offices will also each have one kiosk with Internet and a printer. The post offices will accept the hard copy customs form until further notice, but the online form is now being accepted. Fill out customs forms online at www.usps.com/international/customs-forms.htm. When filling out your customs form online, you have three options. Non-Registered Account Users: Use this option if you do not want to create an account and do not want your information to be stored for the next time. Registered Account Users: Use this option if you would like your information to be stored for faster form completion the next time. Click-N-Ship Account Users: Your information is stored, shipping addresses are stored, pay online with a five to eight percent discount from in store payment, Express Lane access at Post Office. Saves you both time and money. When you fill out your online customs form, you’ll need to enter a weight. You have two options: Weigh your package at home and record the weight on your customs form. Alternatively, choose to use a flat rate box available at the post office or ordered online. All items weighing less than one pound should be rounded up to one pound. And if larger than 12 inches in length, measurements will also be required. Same-day shipping is still possible with the new procedures. Allow 4 hours between completion of online Customs form and shipment. It is recommended that customs forms be completed no later than 1 p.m. if you would like same day shipment. Customs forms cannot be duplicated. A separate form must be filled out for each additional package. What is the garrison doing to help? The garrison will set up one kiosk with Internet and a printer at each post office at USAG Bavaria. You can fill out your customs forms online and print at each Post Office. Post office officials, however, highly encourage you to complete and print your forms at home. Each form takes approximately five to seven minutes to complete. Completing and printing at home will prevent long lines and extensive wait time. If you have questions, or you want to voice your concerns, call or stop by a post office near you, or visit the Tower Barracks Postal Facebook page or Rose Barracks Postal Facebook page.